Most of your journeys will be incident or threat free. However there may be the odd occasion when you have cause for concern. Keep alert so you know where you are. Never pick up hitch hikers or give a lift to strangers. In slow or stop and go traffic or when travelling on your own. If possible travel by day on main roads. Plan your route in advance. Make sure your satellite navigation system has an up-to-date map so you don’t get lost or need to stop and ask for directions. Check petrol, oil and tyres before you set off, especially if you are going on a long journey. If you are travelling after dark let someone know your destination, expected arrival time and your planned route. Remember to let them know if your plans change. Make sure your mobile phone is charged and in the car with you. Remember, don’t use it whilst driving, if you need to make a call stop at a safe place. Keep some small change in the car, you never know when you may need it, your phone may be out of range or flat when you need to make an urgent call. Make sure your car is serviced regularly. You could consider purchasing breakdown cover from a national breakdown organisation. Pull over and stop in a busy, well lit area, near a phone box if you don’t have a mobile phone. Contact your motoring organisation or garage to get help immediately. If you are feeling vulnerable or in need of special attention let the recovery helpline operator know. Always lock your car, even if you are just popping into the garage to pay for petrol. Park in a well-lit area where there are people about, especially after dark or if you will not be returning to your car until late. Always try and reverse into position, this means you can quickly get away. If possible when parking in a multi-storey car park choose a space close to the exit and ramp. Make sure you know where you have parked so you are not wandering around looking for your car. 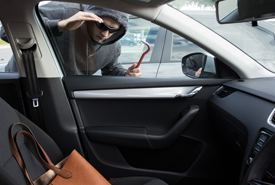 When returning to your car have your keys to hand, don’t delay in unlocking the doors and driving away. If you don’t feel safe, ask a colleague or friend to walk you to your car. Never leave valuables in a parked car. Keep your valuables out the way. Do not leave handbags, mobile phones or laptops on the passenger seat. They could get ‘snatched’ at traffic lights, ideally keep them in the rear passenger footwell behind you or in the boot. What would you do if your bag was stolen? Keep keys, mobile phone and money separately. Remember harassment or actual attacks are rare. Thinking about how you would deal with a potential situation in advance could give you more confidence and help to reduce the risk. Avoid getting involved in an argument with other people if you can see or are involved in a ‘road rage’ incident. Don’t get out of your car keep your windows closed and your car locked if you are confronted with ‘road rage’. If the driver or passenger in a car next to you at a junction or a traffic lights tries to attract your attention ignore them and don’t make eye contact. If someone in a car is deliberately trying to intimidate you, or you think a car is following you, don’t stop, keep driving until you reach a busy public place, ideally a police, fire or ambulance station or a busy pub or garage forecourt. Make sure your doors are locked and the windows closed. Reverse as far as you can and sound your horn continuously, no matter what time it is.